The Jacksons were a prominent family in Blantyre, owning several farms from as far back as the 1500’s. They were amongst some of the original heritors of Blantyre, responsible for maintaining the Parish on behalf of Lord Blantyre. During the 1700’s their land and property had spread from Bardykes to the nearby hamlet at Barnhill. 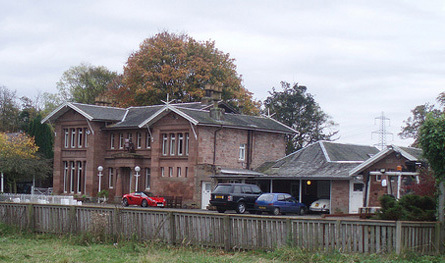 There’s evidence that although they had sufficient wealth to establish large farmhouses within the town, they were also very active and involved in building construction and the civil development of Blantyre. They were well respected within the community. I have uncovered various examples of fundraising and donations lending support to the construction of public buildings to be enjoyed all. Family fortune was accumulated also through further hard work and effort when in the 1700’s, they opened up a tea import business. This wealth was shared between their rather large family and I can see a trend where Jacksons, at one time or other lived in and owned several of Blantyre’s other big houses, e.g. Old Place, Croftfoot, Blantyre Park as well as their ancestral home of Bardykes. Many of these were connected to farming. I’m certain that there are many Blantyre residents currently alive today with the surname Jackson, directly descended from this notable family. To those people, I give you this beautiful motto, which has served the Jackson family well. It’s inscribed on the stone Obelisk memorial on their family graves, which can be witnessed in the Kirkton graveyard. “Blessed are the dead who die in the Lord. They rest from their labours and their works do follow them”. Simply put, it means have faith in the Lord, work hard and your efforts will be remembered. By the very fact that I’m writing about them, the motto has proved it’s worth. I think the statement is also very fitting for all the hard working people of Blantyre. Thank you Charles. Bardykes is a house I’ve not had time to investigate and write about properly yet. I mean to write a defining article about it soon, as it forms such a prominent part of Blantyre history. Thanks for the nice comments.